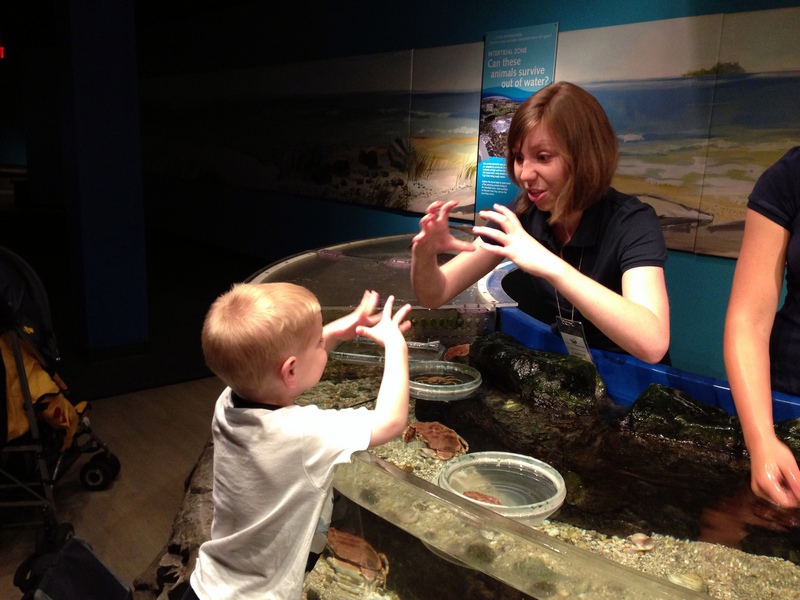 I have loved visiting the Maritime Aquarium at Norwalk since my Grandma Jean took me there over 20 years ago; I have vivid memories of being SUPER excited to pet the sea stars in the touch tank. Since those days, I have loved taking my cousins to visit, and now my own children. 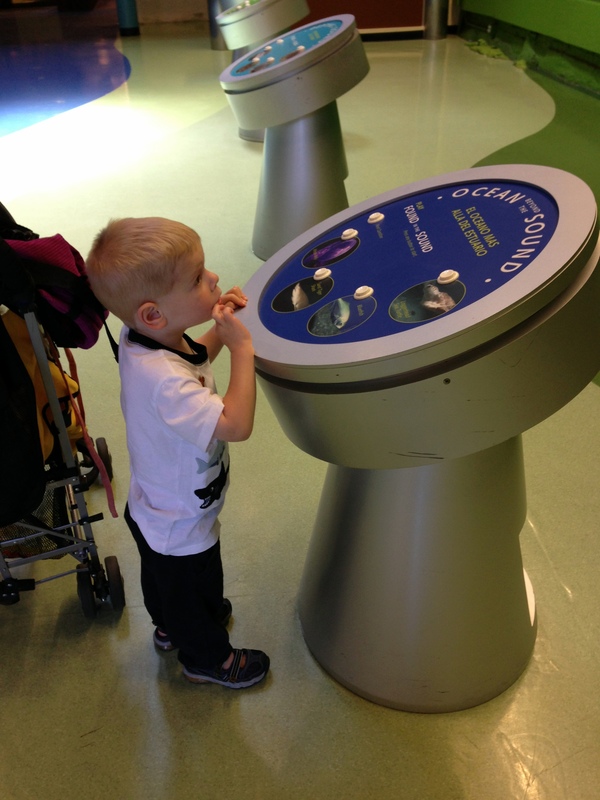 The aquarium has experienced quite the makeover over the past few decades; those touch tanks are still a main attraction for my family, but we also love the IMAX theater, the meerkats, and the brand new Lorikeets exhibit. Norwalk, also home to Stepping Stones Children’s Museum, is technically about the same distance away as the NY Aquarium, but it’s *much* quicker to get there – it takes us under an hour. Adult admission is $19.95, and children (ages 3-12) get in for $12.95, or you can become Family Members for a very reasonable $150. 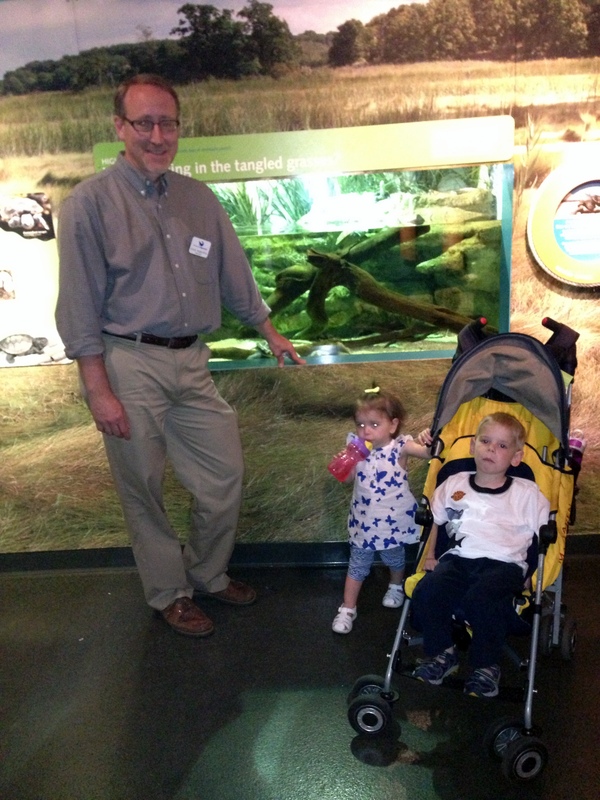 As soon as we got to the aquarium, we headed out to see this summer’s special exhibit: Lorikeets! 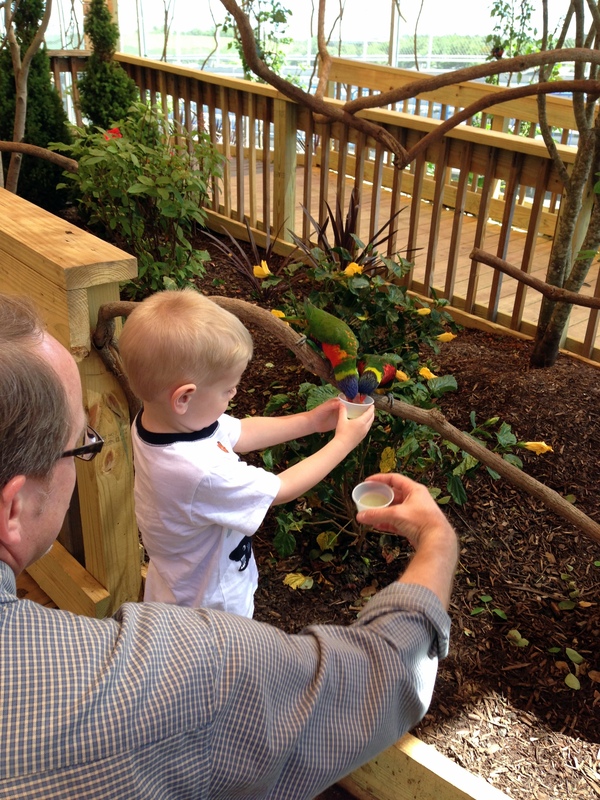 There are more than 50 small parrots in the outdoor aviary and for $3 you can purchase cups of nectar to feed them with. Watch out – one of them nibbled Cole’s fingers! There was no injury or anything, but he was startled and upset for a moment, so if your young child is feeding the birds, keep your eye out. Why lorikeets at the aquarium? 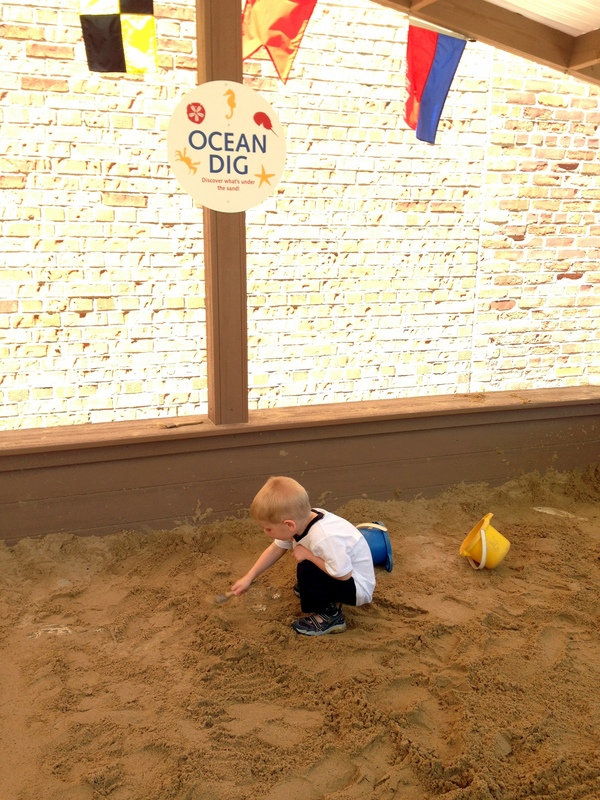 Every summer, the maritime center has a special visiting exhibit. Occasionally, the special exhibit is so popular that it gets extended – which explains the meerkats! 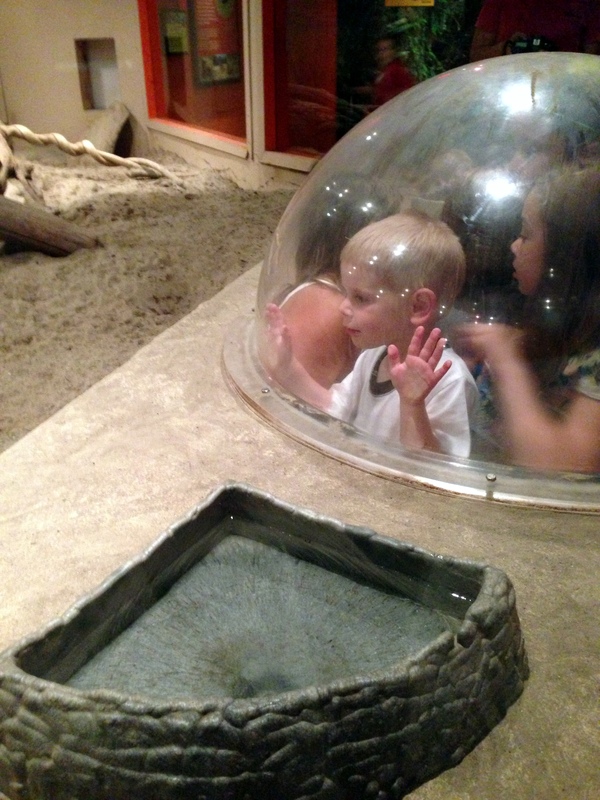 After our bird encounter, Cole was *totally* ready to go pet a shark, but the shark and ray touch tank was completely over run with field trip kids; by 1:30 most of the classes were heading back to their schools and we had the place mostly to ourselves. The school year has come to an end, but camp groups would have a similar schedule so you might want to factor that into your plans. Also, rainy weekends tend to be *very* crowded, so maybe think about going on a nicer day. We ended up crossing through the main hall on our way to grab lunch and wait out the crowds a little bit; Newman’s Own Hall is home to a few seals, and also features a large interactive wall which quizzes you on the inhabitants of the Long Island Sound. The cafeteria serves standard snack bar fare: chicken fingers, pizza, premade salads, etc., in addition to some seafood-centered offerings: clam chowder, fish and chips. The food is okay, and it’s convenient if you’re dealing with young kids, but it’s kind of overpriced. We usually leave the aquarium when it’s time to eat; the Thai place across the street is decent, but our FAVORITES are the Burger Bar & Bistro (try the frickles), and Chocopologie. After lunch, we wandered through the exhibit halls. They are organized by habitat – starting with the shallows and marshland of the Long Island Sound and gradually getting deeper. One of the highlights is the 110,000 gallon ocean tank home to sharks and large fish. The gallery outside of the ocean tank has a quiet seating area, and is one of our favorite spaces to pause for a few minutes. 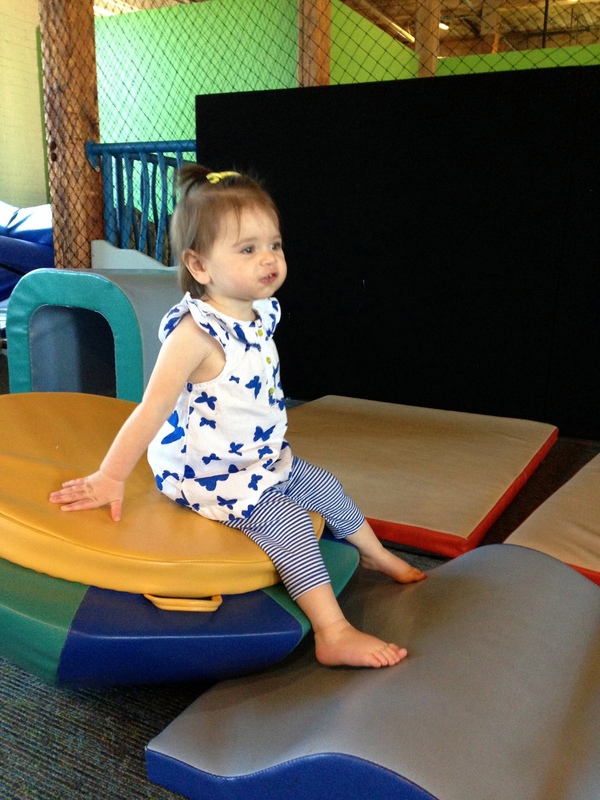 We also spent some time in the soft play area. Lulu loved it! There are mats for kids 5 and under to get their wiggles out, and relieve some energy. Cole wanted to visit the lorikeets again, so we went outside and then were distracted by the ocean dig area; there is a large sandbox filled with buried “fossils” for kids to discover. 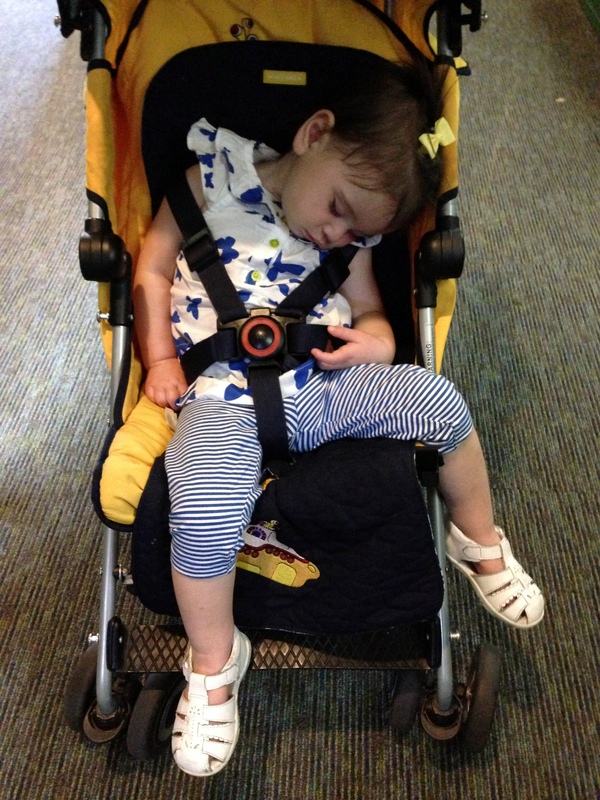 Lulu missed out because she was tuckered from the soft play. 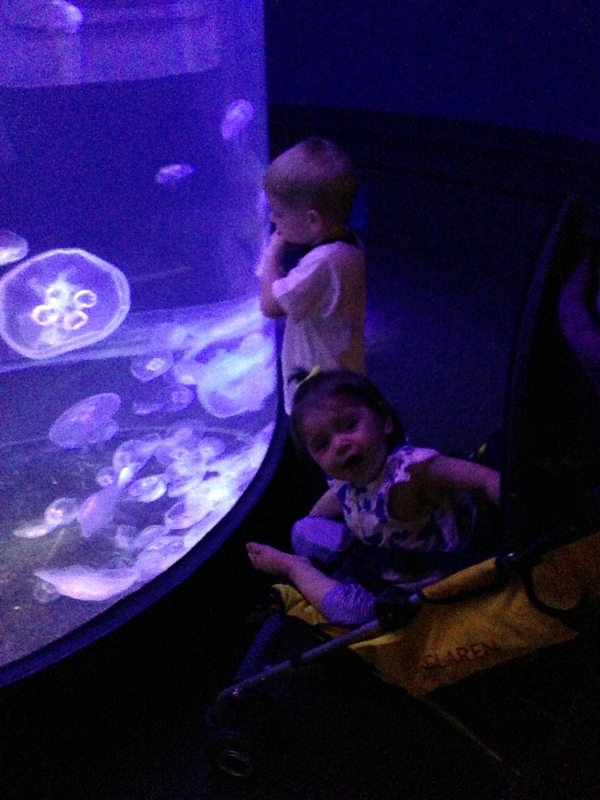 Finally, we went back in to hit up the shark and ray touch tank again. It was a HUGE hit! Cole spent over half an hour trying out several vantage points from around the perimeter – and bossing around the other kids. 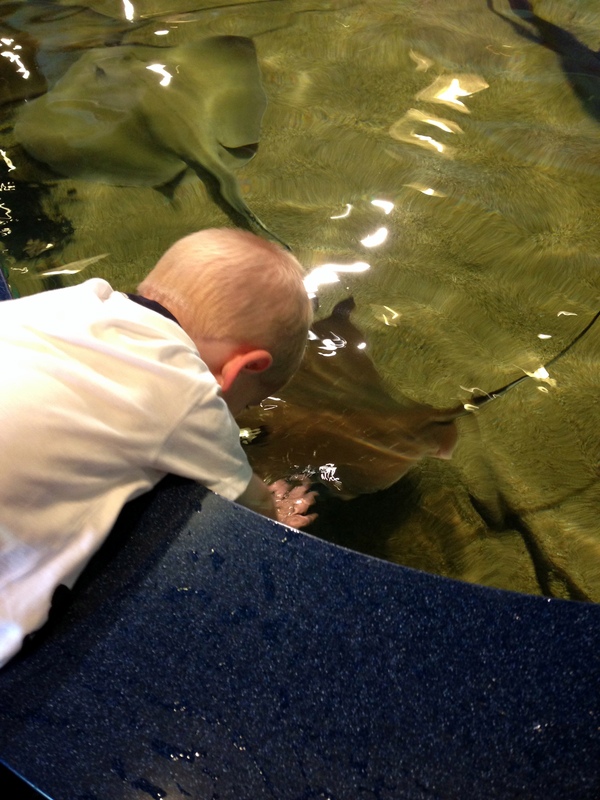 He was militant about splashing – “the rays will not like you,” he explained to the preteen standing next to us, “unless you are quiet like me.” He chickened out of touching the shark, but I’m pretty sure he made friends with every single ray in the group. 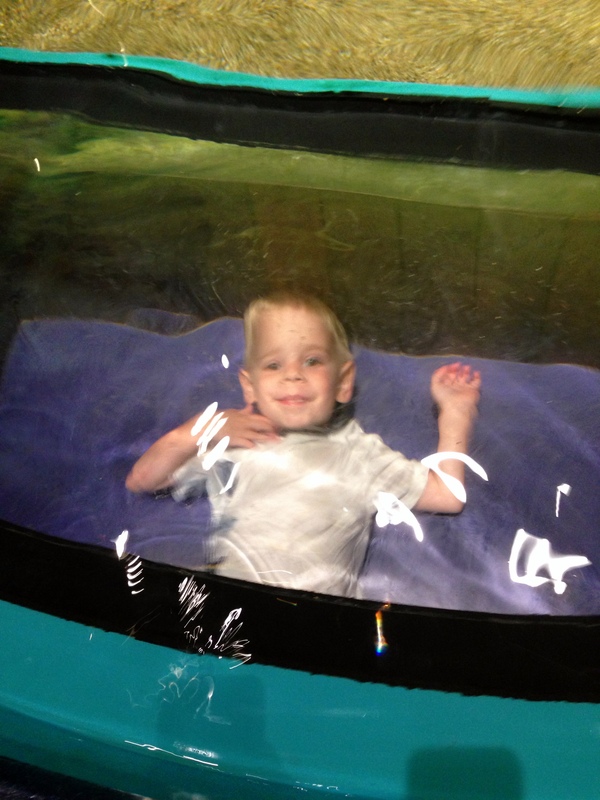 We spent over 4 hours in the aquarium, and Cole still was not ready to leave when it was time to go! 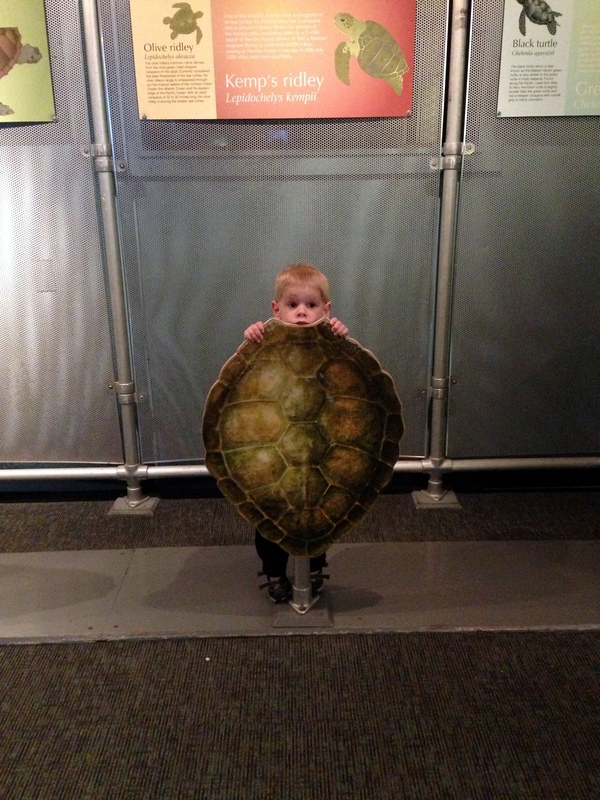 He could have easily visited each exhibit at least one more time – and Lulu was happy to tag along. He seems to have made his peace with the meerkats. 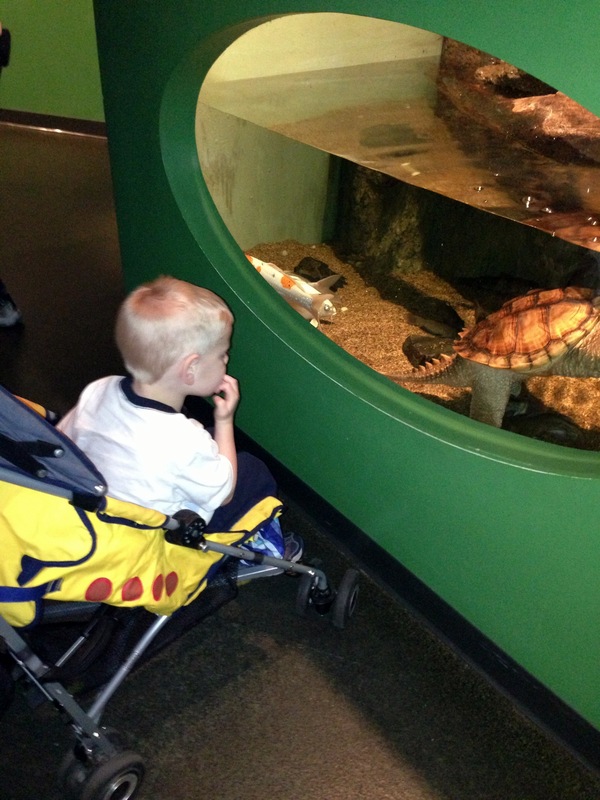 We love, love, love the Norwalk Aquarium, so if you’re planning a visit let us know – we’ll meet you there! Our friend Dave comped our admission, gave us a tour, and generously purchased a few cups of nectar to feed the lorikeets. 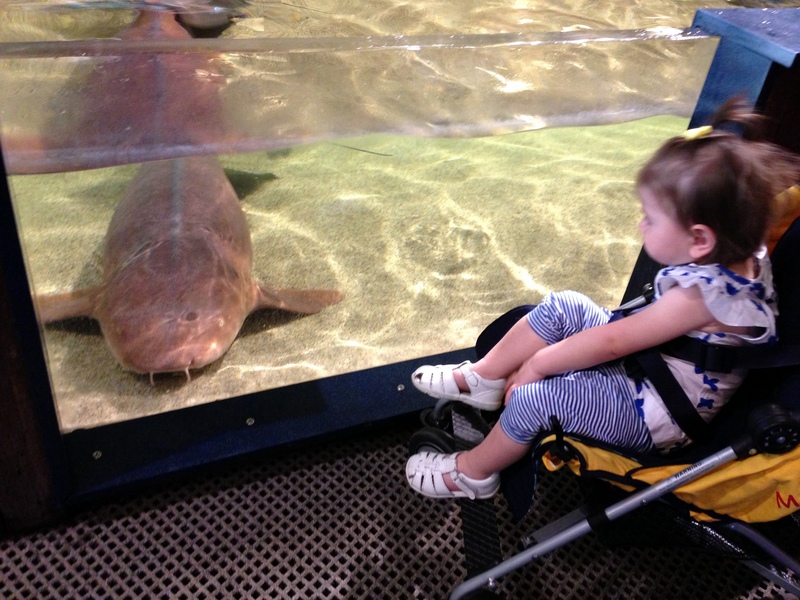 We have paid our own admission in the past, however, and for sure will in the future – Norwalk Aquarium is a favorite in our day trip rotation!